This post contains affiliate links. If you decide to make a purchase through these links, I earn a small commission at no cost to you. Regardless, I only recommend products or services that I have used and love! On this page, I’ve curated DAS BESTE list of tools, products, and services that I have found to be super valuable in creating, growing, and optimizing my blog. I love to share what I’ve learned over the years, and I know these resources will help you achieve your goals quickly and effectively. It’s very possible to grow a successful blog, even if you’re a busy mom. So, Start your Blog today and start making an income from home. I Love Flywheel! The MAIN reasons I love it is for its lightning speed load times, the easy, nightly backups of my entire site, the excellent security, and computer support from REAL people and REAL fast! 24/7 support. If I have an issue, I want it fixed, like, now. And, Flywheel has their experts standing by for immediate fixes and problem-solving. They are Amazing! Flywheel is #1 in Hosting! Great hosting provider! And, extremely affordable. Especially when you are just starting out. They have reliable service and affordable plans from as low as $2.95/month. You also receive a free domain when you purchase your hosting. Bluehost is what I started out with, and I highly recommend them! WordPress is the content management software I use to run my blog, Derby Lane Träume. It’s infinitely customizable and the platform of choice for 99.9% of successful blogs. When you first start-up your new business (like your Blog), you will need to set it up legally as an LLC, corporation, or nonprofit. For instance, my business is Derby Lane Dreams LLC. It’s important to do this for tax purposes and to protect your brand. Also, you will probably want the Affordable Option (like me). Incfile.com helps you quickly and easily form your business. The best part – you can start your business today for $49 plus your state’s fee. That’s it! No hidden fees and no contracts. This is a very important step that you don’t want to skip! Premium, feminine WordPress themes that help elevate your business, instantly! I use the Isabelle Theme for my Home, Travel, and Lifestyle blog site. I also have the Paisley Theme that I like to alternate with sometimes to switch it up! And, what I love most about BLUCHIC is that their themes are beautiful, FAST, and user-friendly. They also have great technical support if you have any issues. LOVE them! This is the pop-up form I use to grow my email list. OptinMonster has helped me significantly increase my daily email subscribers. Also, it lets you display optin forms as a slider, pop-up box, and exit intent, with beautiful templates to use. And, it is super user-friendly, even for newbies! OPTINMONSTER – Find Out More! Get more social media shares with the best sharing plugin for WordPress! Not only will it never slow down your website, Social Warfare gives you the most attractive buttons available that look great no matter what screen size or resolution. And, you can customize your social sharing buttons to your brand colors, to all one color, or whatever you want! Also, you NEVER lose your share counts – no matter what! This plug-in has really helped to get my content out there and grow my monthly sessions. Try Social Warfare for Free! I use the MonsterInsights plugin (along with over 2 million WordPress sites) for the Einfachste way to understand my google analytics. Unlike google analytics (which requires some coding), MonsterInsights does the hard work for you and displays the essential data for your blog. And, it does it right inside your WordPress Dashboard. No Coding required. They also give you additional tracking features that work in the background to help you get more accurate data. The FTC requires that bloggers, affiliates, and publishers disclose their relationships with merchants if they earn money from links within blog posts. This plugin will add a simple FTC-compliant disclosure statement at the beginning of all blog posts. The Pro version allows you to set-up 6 different disclosures so you can use a specific one for each individual blog post. I use ConvertKit as my Email service provider. Actually, everyone that I know that has a blog uses ConvertKit and they LOVE it! It’s easy to use, has tons of automation capabilities, and is great for all bloggers. One of its best tools is the ability tore-send emails to people who have not opened yet. This raises the click and conversion rate for every email you send! ConvertKit helps you to quickly and consistently grow your business through attractive forms, trackable data, and simple but powerful automations. It’s Ah-Mazing! There it is again! It truly does what it says – huge increase in subscribers after signing up with OptinMonster. Over 700,000 websites are using it to turn website traffic into leads, conversions, and SALES! Bluchic has beautiful themes, but they ALSO have gorgeous and easy-to-use Landing Page templates and Social Media templates. Their templates work seamlessly with your WordPress theme, whether or not you use one of theirs. Cut out the stress and time it takes to build your marketing campaigns and save time and energy, with beautiful, high-converting results. #1 The BEST thing you can do for your BLOG! This Pinterest scheduling tool saves me so much time! I use it to schedule my pins in bulk and it will automatically pin them to the boards I want them shared to on schedule. And, now it also has the Smart Loop feature, so Tailwind will always loop my best and most popular content on auto-pilot! Tailwind also analyzes your best pinning times so you can get the most views on your pins. I get 95% of my traffic from Pinterest, and Tailwind is what keeps my pins organized, looped, and in front of my audience. And, THAT is how you grow your traffic, page views, and income! This slide-in Pop-Up helps you grow your email list and followers FAST! Get pop-ups for Instagram, Pinterest, Facebook, YouTube, and Email. You can even DEMO your pop-up to see what it would actually look like! Convert your visitors into followers, subscribers, and customers. MiloTree also sends you tips on how to increase your followers by the thousands. And, their tips WORK! Try MiloTree for Free Now! This is an awesome little “Wise Stamp” that is automatically generated when you compose or reply to emails. Set-up takes 60 seconds. Then, it increases social reach, helps brand your business, and generates 15% more leads and conversions! I like that you can add all of your social sharing buttons, add your photo, gif, brand colors, etc. And, you can always just use the FREE version – forever! Get Yours For Free Here! Buffer is a social media scheduler I use to schedule my Facebook and Twitter posts. Buffer is super easy to use, which is partly why it’s so popular. When you connect a social network to Buffer, you can start composing new posts to add to your post queue. Every time you add a new post to your queue, it will be scheduled to automatically post to your account at each consecutive time. I have been using Picmonkey since 2014 and I LOVE it! I use Picmonkey for creating tons of images with text overlay and cool effects. They also have amazing graphic design templates sized for ANY social media like Pinterest, Twitter, Face Book, & Instagram. And, PicMonkey is SO EASY to use! Even my kids can sit at my computer and create designs and cards for school. I also use PicMonkey for designing my Pinterest Pins, which do really well on Pinterest! 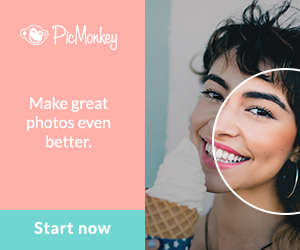 Start Your PICMONKEY Free Trial! I LOVE the Hungry Jpeg. This is a network of Free and Premium design resources available for instant download. It helps bloggers, designers, crafters, and anyone to create using affordable fonts, graphics, photos, templates, and more. I use their affordable designs to create my free printables for my subscribers! Seriously, you can’t beat dollar deals! Their sister site is CraftBundles.com. Check out their $1 Deals & Freebies! canva is a simple to use graphic design tool. It allows you to make images and designs for the web or for print. There are free or paid plans and there are tons of cool templates you can use. SendOwl is an online platform where you can easily and inexpensively create a storefront and start selling digital products and services. It enables a rapid launch process, making it as close to “one click” as you can get. Also, SendOwl has a rapid launch process, and you can construct sites for digital items, memberships, subscriptions and drip-enabled content. Try it for free! I have been a member of Haute Stock for several years. I absolutely ADORE their gorgeous photography! All of their photos are very crisp and professional. And, they email their subscribers new batches of photos every week! Also, their seasonal photos are always current and trending, so I know whatever I post will be exceptional! I use Haute Stock for almost all of my blog post featured images, Pinterest, Instagram, Face Book, and Twitter. They also give you step-by-step tutorials and You-tube videos on how to create promotional graphics, how to use digital papers, how to do a brand review, how to pick colors for your brand, and so much more! I have been extremely impressed with their quality and beautiful selections. This is a MUST HAVE for your blog! Get Your Free Haute Stock Photos Now! The SC Stockshop is a premier styled stock photography site for all creatives — bloggers, brands, businesses, and YOU! They have very affordable stock photo options and also give FREE stock photos every month just for signing up for their newsletter! I have purchased several of their image sets and have been extremely happy with all of their photos! Get Your Free SC Stockshop Photos Now! I cannot say enough good things about this company! Ultimate Bundles offers huge bundles of digital products for an insanely low price! I recently purchased a bundle through them that had over $3,000 of courses, ebooks, and resources for only $97. The value of these bundles are incredible and all of the Ultimate Bundles have a really high conversion rate and commission rate. It’s a Win-Win! Amazon Associates is one of the biggest affiliate programs out there and with the widest variety of products. They sell everything from food to furniture. Since it is such a recognized site, your audience may feel more comfortable purchasing something from Amazon.com than some lesser known companies. Even from my first month selling on Amazon.com, I have made a minimum of $200 per month using their affiliate links. It’s very easy to get started as an Amazon affiliate, and they walk you through the process with videos and tutorials. IZEA is a sponsorship marketplace. You can sign up and create your profile, linking to all of your blogs and social media accounts, which allows potential sponsors and advertisers to see a snapshot of your online presence. Creators are compensated for producing unique content such as videos, photos, status updates, and illustrations for marketers or distributing such content on behalf of marketers through their personal websites, blogs, and social media channels. Check out this article about IZEA. ShareASale is a very popular affiliate site! They have been in business for more than 17 years, and they’ve worked hard to become one of the top names in the business. They also excel at integrated search features and customized deep linking, as well as helpful reporting. And, with their huge variety of merchants, you’ll always have something to promote in your niche! This is a good place to start when you are new to affiliate marketing. ShopStyle Collective is the premier influencer and blogger affiliate network, allowing influencers to monetize their content while growing their brand and audience with SSC’s guidance, data, and innovative tools. This is also a great one for newbie affiliate marketers.